Construction on the soccer goals begins today. Metal poles have been purchased in Kampala and are making the 8+ hour drive to camp. Our welder and his equipment will join the truck in Gulu. Goal construction will take 2 days. Palabek World Cup Tournament is scheduled for next weekend! Posters are being hung in camp. The glue is made by cooking porridge a special way, Glue is applied to posters with hands. Easy clean up! Since starting FUNDaFIELD, our goal has been to give the most deserving kids in the world the chance to play. 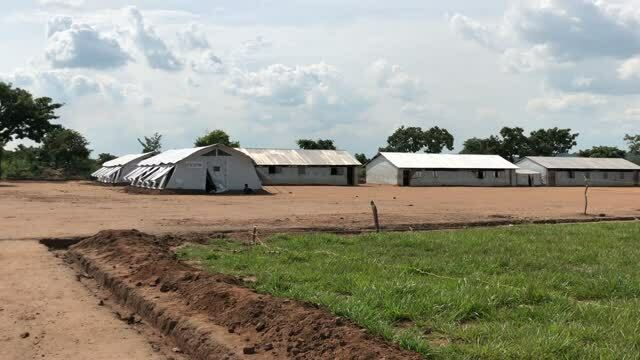 To achieve this goal, the team has been working to complete construction of two soccer fields in the UN Palabek Refugee Camp in Northern Uganda. The camp opened in April, 2017 with funding focused on the survival of 34,000 refugees from Southern Sudan. In addition to the issues the refugees overcome each day, the youth deal daily with tribal barriers, idleness and hopelessness. The children in these camps have been through unspeakable horrors, and we believe that bringing some semblance of games and joy to their lives will be our most impactful work to date. ﻿We are $17,000 away from finishing the fields in zones 1 and 7 and holding a massive tournament celebration to open the sites. We need funding to complete field construction on both fields and to host the 2018 Palabek World Cup Tournament on June 22 & 23rd! The good news is that FUNDaFIELD has a generous donor who will match your donations to help us reach this $17,000 goal. You give $1 and he gives $1, you give $100, he gives $100, you give $1,000 and he does the same! Please help us reach our goal. Thank you for caring and for sharing! We know that these issues can seem unsolvable and overwhelming, but please know that every bit of support goes a long way towards making a tangible impact on some of the most deserving people on the planet. Wishing you a wonderful week and thank you for your support!